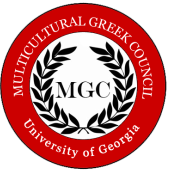 The Multicultural Greek Council was founded on October 7, 2004 by three organizations: Delta Phi Lambda Sorority, Inc., Lambda Phi Epsilon Fraternity, Inc., and Sigma Beta Rho Fraternity, Inc.
Foster scholastic achievements and leadership. Promote community service and awareness in the Athens community. Provide resources and support to the members of our multicultural fraternities and sororities. Offer a forum for discussion and to develop strategies regarding issues relevant to the MGC community. Involvement in a Multicultural Greek organization can enhance your collegiate experience and help develop skills in leadership, communications, and social networking. All of our organizations have a unique background, so I encourage you to learn about each one and keep an open mind. No matter what cultural background you are from, the friendships, traditions, memories, and new experiences you make while being a part of our council will continue with you for many years to come. Whichever path you choose, I wish you the best in your future endeavors here at the University of Georgia. Please feel free to navigate our website and find us on social networks for more information regarding our organizations. All members of the council are required to maintain at least a 2.65 GPA. Our MGC office is located on the 1st floor of Old Tate in the Greek Life Office!